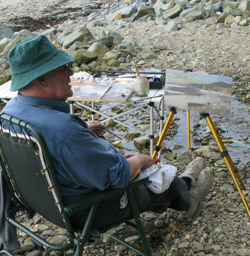 Fred is one of Britain’s most respected oil painters who responds to mood and atmosphere generated by the landscape. His usual method of working involves making a collection of drawings, sketches and paintings which he then uses as inspiration to produce larger paintings in his studio. 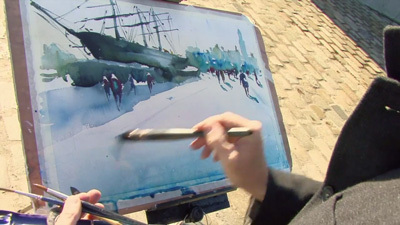 In this film he travels to St Michael’s Mount in Cornwall where he paints atmospheric views of the bay and the surrounding landscape. 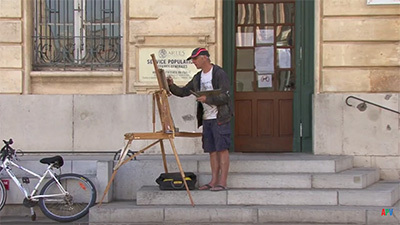 We then see him working on two large oil paintings in his studio. 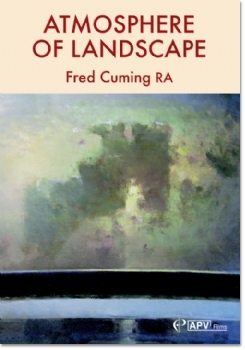 Atmosphere of Landscape, Fred Cuming’s second film for APV, provides an excellent insight into this Royal Academician’s methods of working. Focusing on the beautiful Cornish bay where St Michael’s Mount rises from the sands, and looking towards Marazion and Penzance, Cuming demonstrates how he builds his compositions, steadily developing tonal relationships through which arresting atmospheric statements emerge. Cuming’s practice involves making a series of drawings, watercolours and oil studies which he then takes back to his studio to provide inspiration for more formal paintings. He is very much a tonal painter, having been trained to paint initially in black and white to understand tonal contrast and balance, but he is also highly motivated by colour which is communicated through his engaging and enthusiastic commentary. 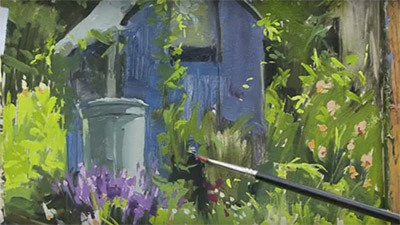 On location, we see him tackle his compositions by building up shapes on coloured grounds, and moving on to identify the brightest highlights. As Cuming says, successful paintings are often the product of risk taking, and we watch him, in his second painting, walk that narrow line. Having defined buildings and vegetation, he then energetically blends the areas together, embracing the challenge of looking disaster in the face, or achieving atmospheric victory. Four main sketches are developed whilst in Cornwall; two down on the beach, and two from a higher vantage point, with the final painting featuring simply the sky and sea. None of these are resolved, and Cuming doesn’t have a particular idea as to what he intends to create from them when back in the studio, but along with the other studies he has made, he has a wealth of information to work with. Two finished paintings evolve from the reference material back in Cuming’s studio. The first, a large square canvas, captures his view of St Michael’s Mount, but altered from daytime to dusk, creating a more contemplative mood. By the time it gets to his gallery it is changed quite dramatically, with the forms simplified, and a greater sense of contrast through a darker colour range. 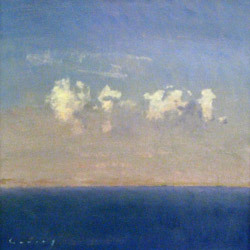 The final painting is developed from a couple of watercolours, focusing just on the sea and sky. It starts with large areas of colour and texture, but gradually simplifies into geometric bands with the sea creating a hard shape, with dramatic light soaring above it. 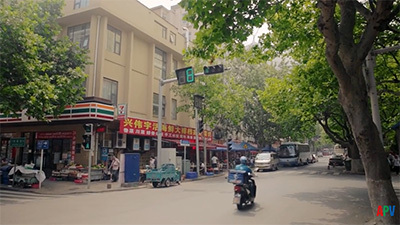 Cuming provides us with a highly enjoyable and instructional film that might encourage viewers to take a braver approach to their work. 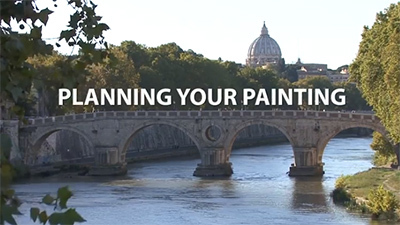 Fred Cuming is one of the most respected landscape artists of the present day, and he is particularly admired for his ability to capture atmosphere and a powerful sense of place. His work is sensitive, immensely thoughtful and considered, poetic and inspirational. For his new film Atmosphere of Landscape he travels to St Michael’s Mount in Cornwall. Here, he makes oil studies and also colour notes in watercolour of a variety of subjects that will possibly lead to further ideas or more resolved paintings later. 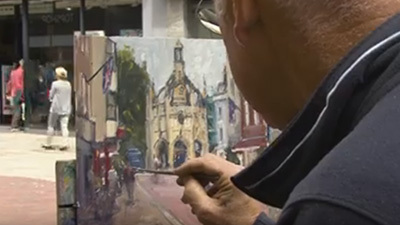 It is fascinating to watch Fred at work, to hear his thoughts about aspects such as composition and light, tone and colour relationships, and to see how he develops ideas on a bigger scale in his studio. His aim, he says, ‘is for paintings that not only stimulate my imagination, but require the onlooker to take part as well’. This is my most recent acquisition from APV, and the best yet. 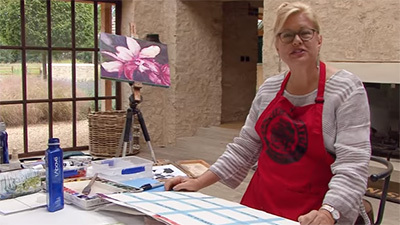 Watching and listening to Fred Cuming is inspirational, and following one of his examples painting in the studio from a watercolour sketch, has been a truly liberating experience. You have to learn to read between the lines when listening to artists like this but everytime I watch this DVD I seem to pick up on yet another fresh thought.